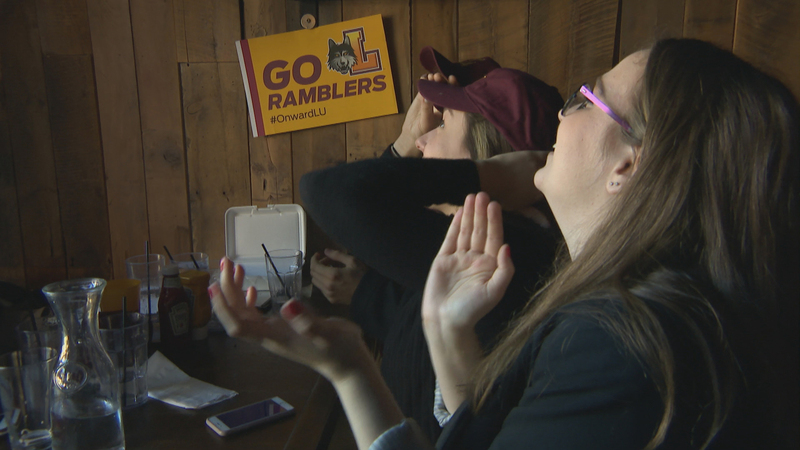 Loyola Ramblers fans cheer on the team at in Rogers Park bar Bruno’s on Thursday, March 15, 2018. As has become the norm in the Loyola Rambler’s heart-pounding NCAA Tournament run, it came down to the final seconds Thursday. Junior guard Marques Townes hit a 3-pointer with six seconds left to put the Ramblers up 69-65. Their opponents, the Nevada Wolf Pack, would cut the lead down to 69-68 with one second to go, but in the end it was too little too late. Loyola will now advance to take on the winner of Kentucky vs. Kansas State. It was fitting that Townes hit the clutch shot, as he led all Loyola scorers with 18 points and dished out five assists. Senior transfer guard Clayton Custer knocked down 15 points, including several nifty drives to the basket. Loyola scored the bulk of its points in the paint against the taller Nevada team. The Ramblers hit on their first 13 of 13 shots in the second half to open up a double-digit lead, before the Wolfpack came storming back. The Ramblers started the game cold, falling behind 20-8 before storming back to take a 28-24 lead into halftime. Loyola chaplain and international celebrity, Sister Jean, picked Loyola to lose in the Sweet 16 round, a point that wasn’t lost on Custer. This is the farthest the Ramblers have gone in the NCAA Tournament since they won the national championship in 1963, a remarkable feat considering the level of competition across the country.